Welcome to the second installment of “Flashback Fridays”! This particular journal entry was an emotional one. 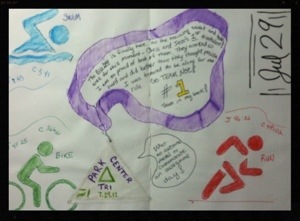 The page chronicles my husband and sister-in-law’s awe inspiring feat of finishing their first triathlon together! After months of training, it all came down to this single day. I couldn’t be prouder of my husband and sis! I felt so honored just to be there to support them and be able put to paper about how I feel about this momentous occasion. Thanks for sharing in this flashback with me- until next time!